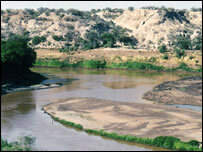 The age estimate comes from a re-dating of Ethiopian rock layers close to those that yielded the remarkable fossils. 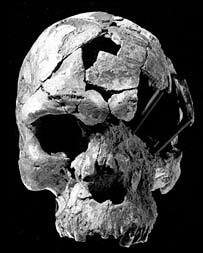 The skulls, known as Omo I and II, push back the known presence of Homo sapiens in Africa by 40,000 years. The latest dating work is reported in the science journal Nature. It puts the specimens close to the time expected for the evolutionary emergence of our species. Genetic studies have indicated Homo sapiens arose in East Africa - possibly Ethiopia or Tanzania - just over 200,000 years ago. "These are the earliest known examples of our own species and that suggests they lived earlier still," commented Nature senior editor Dr Henry Gee. "But I am not sure how much further back you could go and still have Homo sapiens - before they graded into some other, earlier species," he told the BBC News website. The skulls were first brought to the attention of the world by the famous fossil hunter Richard Leakey, whose team unearthed the specimens in sediments along the Omo River in southernmost Ethiopia, near the town of Kibish. They found the skull (minus the face) and partial skeleton (parts of arms, legs, feet and the pelvis) of Omo I, and the top and back of the skull of Omo II. 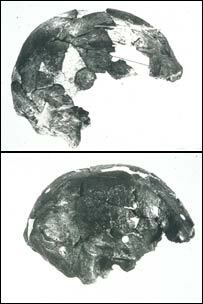 Now, a three-man Australian-US team - Ian McDougall, Frank Brown and John Fleagle - has re-evaluated the Leakey finds. The team even returned to the original excavation area, using old scientific reports, photographs and film to identify the precise dig co-ordinates. "Omo I actually has the better information on it," explained co-author Professor Brown, from the University of Utah's College of Mines and Earth Sciences. "[The records and maps] are correct and we actually went back and found a few more pieces of the skeleton and some of them glue on to the pieces that were found in 1967." 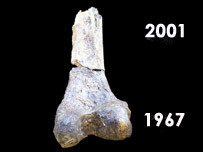 The original dating in 1967 found the fossils to be 130,000 years old. This was based on the decay rate of radioactive uranium atoms contained in oyster shells found near the skulls - "but that date should always have been taken with a pinch of salt", Professor Brown told BBC News. "Molluscs are not really very good for that kind of thing." The new results, though, are regarded as far more robust. They depend on the known decay rate of radioactive atoms of potassium-40 into the gas argon-40 in feldspar mineral crystals. These crystals were retrieved from chunks of pumice in volcanic ash layers above and below the skulls. They suggested the specimens must be between 104,000 and 196,000 years old - but with some additional climate evidence on ancient flooding in the region, the team was able to show the Omo finds were actually very close to the 196,000-year mark. Dr Chris Stringer, from London's Natural History Museum, worked on the skulls more than 20 years ago. He told BBC News: "I was of the opinion that Omo I was a modern human - Omo II seemed much more primitive. So, from my point of view I thought Omo II might be older than Omo I. "But it seems that they are about the same age and that shows that the populations in Africa at that time were very variable. They show different mixtures of primitive and modern characteristics." The previous oldest Homo sapiens skulls were uncovered in sediments near a village called Herto in the Afar region in the east of Ethiopia. These were dated to between 154,000 and 160,000 years old. Although researchers are pushing at the evolutionary base of our species, they still have much to discover in terms of these early people's behaviour. Professor Brown explains: "...the cultural aspects of humanity in most cases appear much later in the record - only 50,000 years ago - which would mean 150,000 years of Homo sapiens without cultural stuff, such as evidence of eating fish, of harpoons, anything to do with music (flutes and that sort of thing), needles, even tools. "This stuff all comes in very late, except for stone knife blades, which appeared between 50,000 and 200,000 years ago, depending on whom you believe." Professor John Fleagle, of New York state's Stony Brook University, adds: "There is a huge debate in the archaeological literature regarding the first appearance of modern aspects of behaviour such as bone carving for religious reasons, or tools, ornamentation (bead jewellery and such), drawn images, and arrowheads. "They only appear as a coherent package about 50,000 years ago, and the first modern humans that left Africa between 50,000 and 40,000 years ago seem to have had the full set. "As modern human anatomy is documented at earlier and earlier sites, it becomes evident that there was a great time gap between the appearance of the modern skeleton and 'modern behaviour'."